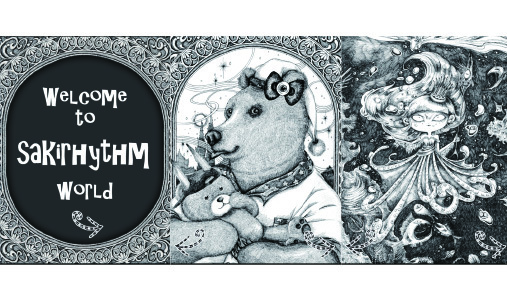 ‘sakirhythm’ is a digital picture book filled with dark fantasy, created by Saki Murakami. This piece was produced for readers to be familiar with the ‘Scary but cute (Kowa kawaii)’ world, which Murakami produces on a regular basis. This book is designed for every reader, from children to adults, to read, touch and be amazed by reading the book. There are many hidden interactions, with sounds and moving illustrations. Even for people who do not visit the museum, it is designed for the reader to casually experience the world of art. Thank you for the Flying Cat Award. I have been researching on ‘Children’s Play’ since I was a student at Tokyo University of the Arts, so I am truly honored to receive the award. I am currently working at a game company while working as an artist in my free time. I have been receiving feedbacks that my art work has a narrative element to it, so I always hoped to present my work via children’s books. This is when I met the Flying Cat tool, and has triggered me to make this app. The tool was very easy to use, even for a user like myself who is not a programmer. I was also able to integrate my knowledge as a game designer. With children interacting with my ‘Scary but Cute’ art work, I hope it will stimulate children’s creative mind.